Hopefully you all had a great, safe, and restful holiday celebrating those who have given the ultimate sacrifice to protect our country. I know I have quite a few of those in my family alone. I spent some much needed time at home, resting and relaxing. Things have been a bit crazy lately so I have been taking every chance I can get to enjoy some downtime. Over the last few weeks I have smoked quite a few of Kuuts blends. Not familiar with the blend? Not surprising. Kuuts has actually been in the cigar business for 15 years now doing most of their business over-seas in the European market. They have only recently decided to bring their blends to the US. They also recently opened up shop in Danli Nicaragua in hopes of boosting production and distribution. There are 3 blends currently in the US market, the Placeres Reserva, Tabacalara Zapata, and the Miro. I’ll be taking a look at each one of these three blends as well as bringing you some information on each as well as my thoughts. You can read up more about Kuuts and their offerings on their website, or by following them on twitter. They provided me with a few samples to bring you this review. Since these were all quick draws, and I only smoked a few of each, they were all paired with water as to not cloud my palate. Construction/Prelight: The construction on this cigar is magnificent. From foot, to cap this cigar is flawless. The wrapper is a medium brown with some nice yellow and dark brown areas. This cigar is OILY! You could blind someone with the amount of light that reflects off this baby. There are only very few, small, seamless veins throughout the body to the round triple cap. The cigar is very thick and dense and gives little to no give when condensed between my fingers. Burn/Draw: The burn on this cigar is dead even right from the start. There were a few waves once I reached the halfway point which kindly corrected themselves as I burned into the final third. The draw was remarkable. I was a bit scared due to how firm this cigar was, but each puff kicked out tons of creamy smoke. Flavor: There wasn’t too much to this cigar. When I say that, I mean there wasn’t much in terms of complexity, but the flavors were very strong and solid. I picked up some real nice sweetness, cedar, honey, and natural tobacco with hints of earthiness. While the flavor remained pretty similar through the entire experience, the amount of flavors and the creaminess of the combination was enough to keep my satisfied from start to finish. Overview: This is a solid, well-balanced cigar. While I found it a bit too mild for my liking, I think it would fit great for those times when I do actually crave a milder cigar that carries some flavor. The construction really makes this cigar in one word, perfect. The price is reasonable and I’ve seen quite a few sales on these sticks making the price a great value. You can already find these on most of the larger mail-order and b&m’s shelves. Construction/Prelight: This cigar is as dark as the night. Seriously, this cigar is a very dark brown with a reddish tint, and the wrapper is even almost black in some areas. 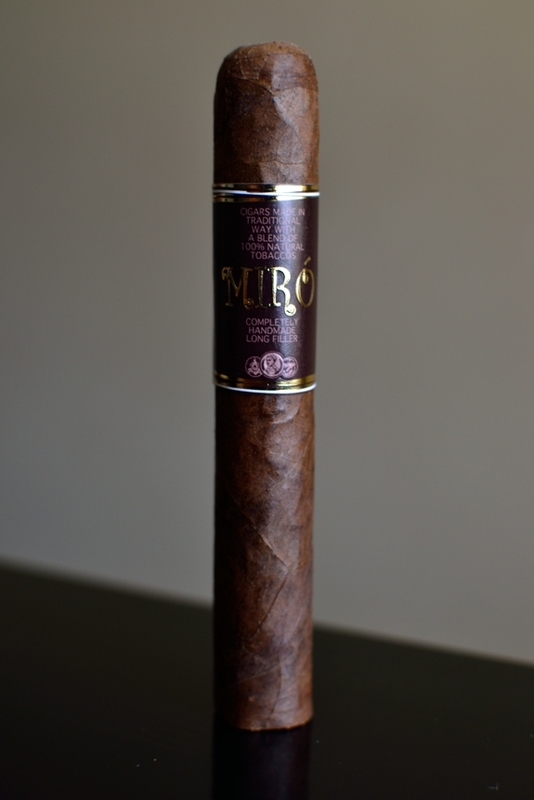 The big, dark purple band only accompanies the dark characteristics of this cigar. This cigar is crazy oily too. I don’t know what Kuuts is doing over there to produce these oils but I like it. The wrapper sports some nice, subtle tooth and very, very small veins as it reaches the round double cap. Unlike the firmness I encountered in the Zapata, this cigar is pretty soft with noticeably softer spots near the foot of the cigar. Burn/Draw: This cigar started out pretty wavy but corrected itself halfway through, only to require some attention from my lighter into the final third of the cigar. The filler seemed to be burning evenly but the wrapper had a bit of trouble keeping itself even. It didn’t bother me, nor did it effect the experience in anyway. 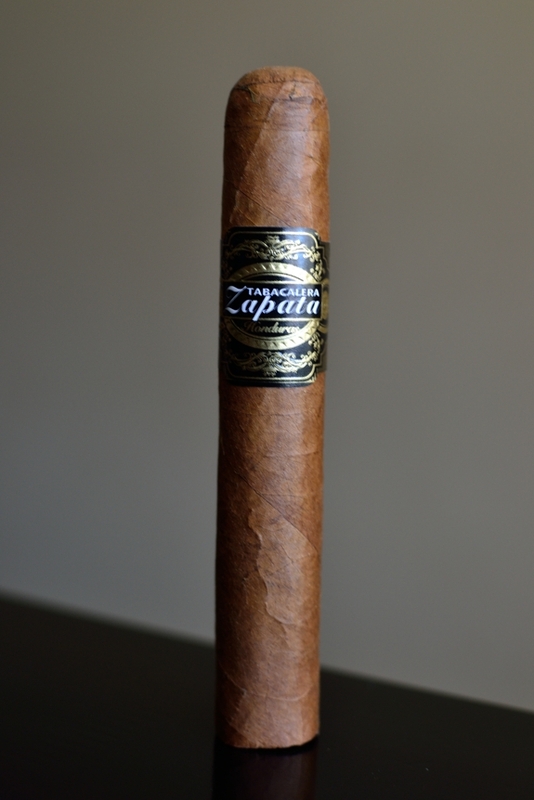 The draw on this cigar was a bit looser than the Zapata but it produced just as much thick, white smoke. Flavor: The Miro pumped out lots and lots of sweetness and chocolate right off the back. Sadly, that quickly faded and I was left with some soft woodsy, leathery, natural flavors. I really wished that sweetness and chocolate stuck around a bit longer as I really enjoyed what it had to offer. Overview: This cigar preformed on par, but just wasn’t for me. The flavors were a bit muffled and it just seemed as if the cigar was missing a certain something that would have really brought it up to another level. The experience and construction however were spot on and I have absolutely no complaints there. Again, same price point as the above cigar with similar sales as well. While this cigar didn’t appeal to my flavor profile I do think cigar smokers that tend to reach for those more traditional, smooth, sweet maduros would really enjoy it. Construction/Prelight: The Placeres Reserva carries a very reddish/dark brown wrapper with darker areas. This cigar is the only box-pressed one in the 3 part series. The box-press is very firm, but in both samples I smoked there was some tenderness around the cap of the cigar, right around there area where you would rest your lips when smoking. The wrapper on this cigar isn’t as oily as the other two but it makes up for it with the tooth, not to mention I love the band. Again, this cigar had very small, seamless veins running through the body of the cigar. Burn/Draw: The cigar started out with some slight waves but it quickly corrected itself to a dead even, razor sharp burn. I never had to break the lighter out the entire experience. The draw on these cigar was incredible. Every little, tiny puff filled my mouth with super thick, white smoke. It’s also worth mentioning that this cigar kicks out a whole ton of stationary smoke. 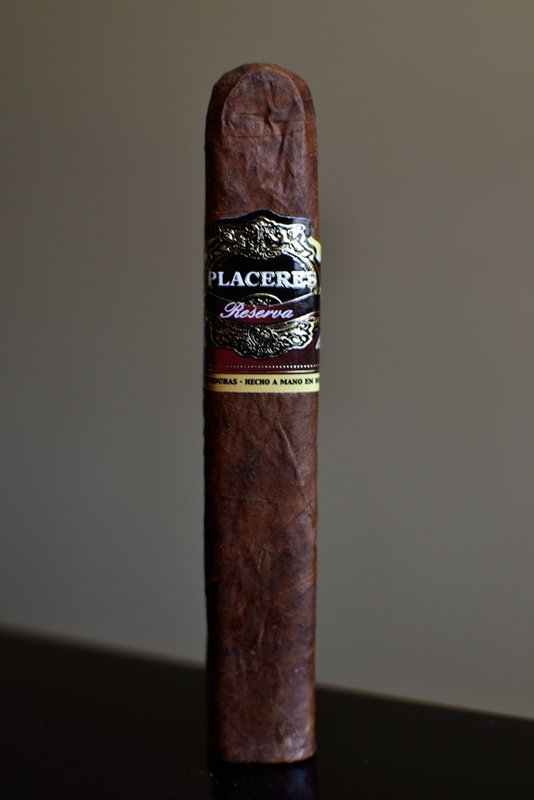 Flavor: The Placeres Reserva started out a bit mild, showcasing some really peppery, spicy notes before the whole cigar took a drastic change just before reaching the second third. On both of the samples I smoked the cigar just poured on the strong spice, cedar, vanilla, and woodsy flavors. It caught me by surprised and I really enjoyed the change-ups. Once I reached the final third the pepper had faded out as a more musky, creamy experience began to form. Overview: Needless to say this was my favorite out of the bunch. I loved the format (I’m a sucker for box-press), and the flavor and complexity of this cigar kept me on my toes the entire time. This cigar seemed to be on a whole different level than the other two in my humble opinion and I think the price point is right where it should be. Heck, I wouldn’t mind pay a bit more as I was pleasantly surprised by this one. Thanks for reviewing all the different lines at once. It makes it so much easier to decided which one to try first, or at all. The Placeres sounds nice, even though it looks a little rough. Did you have a chance to smoke different sizes?